Strong defense is critical in slow pitch softball, and so is making sure the best players are at the toughest positions. Placing weaker players in the field is a challenge, but there are 10 players on the field in slow pitch softball, and several positions require less defensive ability. While strikeouts are common in fast pitch softball and baseball, they are rare in slow pitch. Most pitches are put in play by the hitter, and it is up to the defense to either catch the softball or throw to a base and force the runner out. Field your weakest defensive player at catcher. The position is the easiest to play in slow pitch softball. 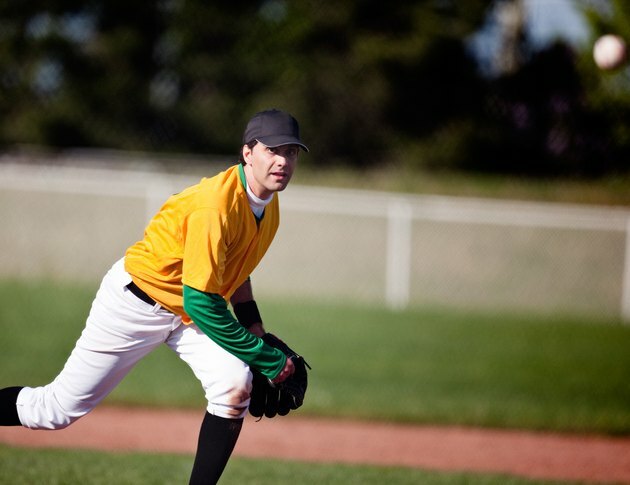 Pitches come in high and slow and are not difficult to handle. Stolen bases are a concern, but according to the AZ Softball Umpire Rulebook, base runners can't try to steal until the pitch crosses the front edge of home plate. Base stealers can run at will in fast pitch softball and baseball. Catching is less challenging because the pitcher, first baseman and third baseman can charge in and field grounders hit in front of the plate. The pitcher can also come in and take the throw during plays at home. Place your weaker fielders at second base. Throws to first base are shorter and do not require a strong throwing arm. Defensive concerns are alleviated by having the pitcher field grounders headed to second base. The first baseman can also field grounders heading toward second. Place a weak defensive player in right field. Most hitters are right-handed, and are able to turn on the pitch and pull the ball to left field in slow pitch softball. Right fielders are typically not involved in as many plays as the two other outfielders, so it is a good spot for a weaker fielder. Position a weaker defensive player in center field. In slow pitch softball, there are 10 players on the field. The extra player -- or rover -- often plays behind second base in short center field. The rover typically has exceptional range, and that takes pressure off the center fielder. In slow pitch softball, the center fielder can let the rover handle most of the routine plays and concentrate on getting to balls hit deeper in the outfield.